Using the Edmodo platform is proving to be very useful as I keep sending many comprehensible resources so that my students can practise regularly and so that I can give them instant feedback on how well they are doing and encourage them to keep going. One of my student has to practise talking about any topic for 4 minutes as it is part of her oral exam. I found this great website aimed at ESL teachers which has a list of different topics with questions to develop the topic. One topic we have been discussing lately is fashion and one question was “Are you a shopaholic?” which I think is good expression as it derived from other expressions such as “workaholic” or “alcoholic“. 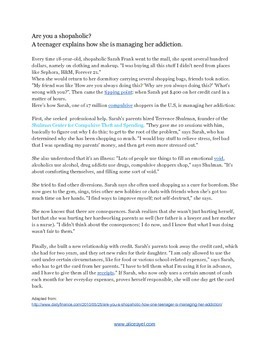 I also found an interesting article about an 18 years old girl who was a shopaholic and is now trying to solve her addiction. I adapted it and I included comprehension and personal questions. < Resources for English learners: superstitions.